Sydney L. Moss Ltd., Escape from the Dusty World: Chinese Paintings and Literati Works of Art, London, 1999, no. 73. The carving style on this cup would appear to be closely related to that of You Kan (also known as Zhi Sheng). You Kan was a prolific carver, particularly skilled at the representation of flora and fauna. According to J. Chapman in The Art of Rhinoceros Horn Carving in China, London, 1999, p. 139, it is possible that he may also have been known as You Bei (rhinoceros horn cup You), a resident of Wuxi who was summoned to work in the Imperial ateliers by the Kangxi emperor. 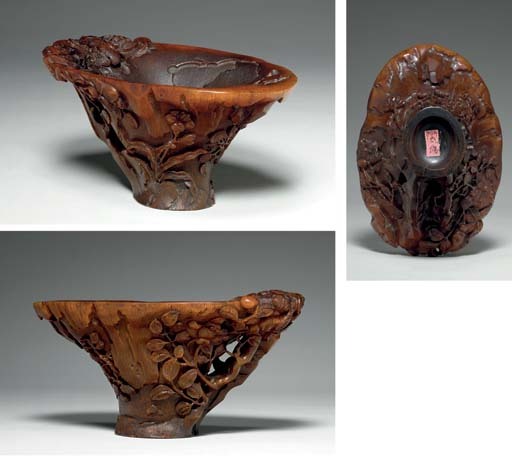 A similarly carved example bearing You Kan's signature was sold Christie's, Hong Kong, 1 November 2004, lot 951 (Fig.1). Particularly similar is the carving of the leaves and the manner in which the rocky base extends over the rim into the mouth of the cup just above the handle.